This post is part of the 2012 TCM Summer Under the Stars Blogathon, hosted by the lovely and talented ScribeHard on Film and Sittin’ on a Backyard Fence. 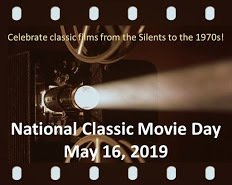 This blogathon runs every day in August. Charles Boyer convinces Ingrid Bergman that she’s going crazy. Have you ever been in a situation so surreal you felt you were being driven out of your mind? This is the situation Ingrid Bergman faces in the 1944 thriller Gaslight. Boyer is delightfully evil in this movie. He has exaggerated airs as the put-upon husband, a man who sighs loudly and talks to his frantic wife as though she were an imbecile. But as strong a presence as Boyer is on screen, Bergman is equally strong if not stronger. Bergman gives an exceptional performance as a woman who cannot believe she’s going insane. Her character is smart and rational, but slowly she’s being convinced that she’s going crazy. Bergman’s disbelief at her accusing husband matches our own; there is simply no way she’s responsible for the things she’s accused of. Her character desperately wants to please her new husband and tries to suppress fits of hysteria when he calmly reprimands her for losing her memory again. You feel for Bergman and cringe every time Boyer gets a certain look in his eye, which means he has a new and troubling accusation. This, in turn, becomes another push towards madness. Slowly, Bergman is isolated and cut off from the world. She becomes nervous and uncertain, and finds she cannot leave the house; she doesn’t trust herself Out In The World. Even the maid (Angela Lansbury in a scene-stealing role) has been turned against her, and speaks to her with utter contempt. Bergman’s only friend is Brian (Joseph Cotten), a detective from Scotland Yard who is suspicious of Boyer. Gaslight is a tense thriller that exploits one of society’s most dreaded fears – the fear of going insane. The real tension in this movie deals with Bergman’s mental health: Can she keep hold of her sanity long enough to expose her husband’s dark secret? Our favourite scene is near the end of the film, when Bergman and Boyer have their final conversation. We will not reveal any details, for fear of giving away the story, but it is a scene so well acted it almost makes you gasp. Bergman shows us her intense acting ability and when the scene is over you almost can’t blink. Then you reach for the rewind button and watch it all over again. It is that good. If you have not yet seen Gaslight, promise us you’ll make it an urgent priority in your life. With incredible acting and directing, plus a water-tight script, you’ll be glad you made the effort to see it. 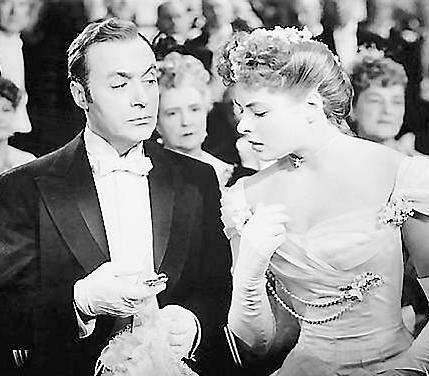 Gaslight: starring Charles Boyer, Ingrid Bergman, Joseph Cotten. Directed by George Cukor. Written by John Van Druten, Walter Reisch, John L. Balderston. Metro-Goldwyn-Mayer, 1944, B&W, 114 mins. Somehow I have never seen this movie and I think that I have made a terrible mistake. Thanks for a great review and recommendation. Well, I finally got around to seeing “Gaslight “and you were right about everything. It was one of the most completely sound movies from start to finish. I loved it and am sure to one day add it to my collection. Thanks ever so much for enriching my movie viewing life this week. So glad you had the chance to see it and that you liked it! Isn’t the acting pitch-perfect? I love love love the last scene Bergman has with Boyer – always gives me a chill. Well written post, I haven’t seen this one in ages but I remember who atmospheric and chilling it was. It is a chilling movie, isn’t it? Everything about it is so well done. Totally agree, keep up the good work. I haven’t seen this film in quite a long time…sounds like it needs to go in the on-deck circle! Thanks for the great write-up! Thanks, Joel. It really is a treat to watch. It’s been a while since I’ve seen this, but I remember liking it a lot, especially Boyer’s performance (though I am curious to see the British original). Nice write-up. I have not seen the British original but I bet it’s just as terrific! I purposely didn’t watch this tonight until I had time to read your post. I know what I’ll be doing in a couple of hours! (After Casablanca) Thanks so much for this review, I can’t wait to see it! Yup – no movie should ever pre-empt Casablanca. (I’m serious!) Hope you were able to see Gaslight & hope you enjoyed it. I had seen “Gaslight” many times before I knew there was an earlier (1940) British version starring Anton Walbrook and Diana Wynyard. Some said the first was the better version. Finally, it aired on TCM and I watched. Much as I prefer Walbrook to Boyer, and as fine an actress as Wynyard is, I much prefer the later version – it’s a tighter, more suspenseful film thanks, no doubt, to George Cukor’s direction – and Ingrid Bergman is absolutely fascinating in the starring role. Plus, there’s Angela Lansbury (and Joseph Cotten). The scene you mention, the last conversation between husband and wife, is a real delight (revenge is sweet). Revenge IS sweet! Thanks for dropping by and commenting. I’ve heard nothing but good things about this film, and can’t wait to check it out in the future. Nice writeup. Dienna, if you have the chance to see it, you really owe it to yourself. “promise us you’ll make it an urgent priority in your life” Good thing I’ve already seen it! Good write up of the movie itself, but that line is the one that made me lol.